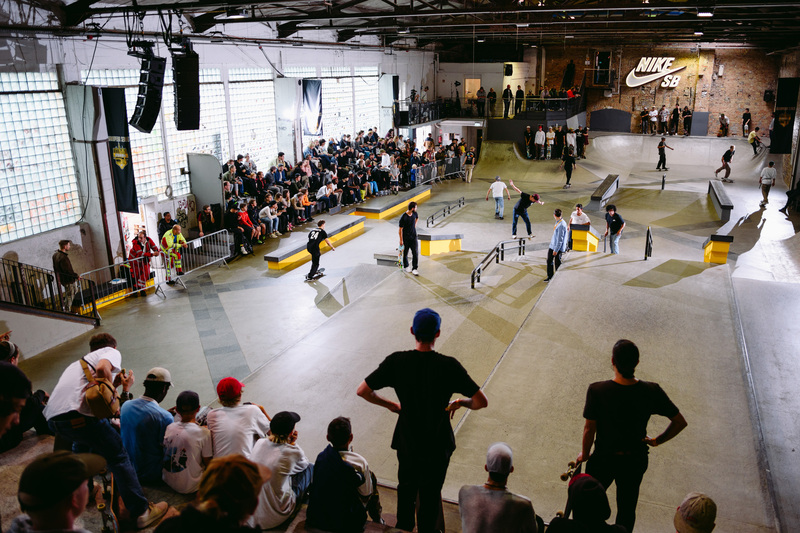 For the fourth year running Nike SB brings us the Berlin Open. It was a wet weekend in Berlin but luckily the Skatehalle kept everyone dry and in good spirits. Obviously a lot of great skating went down, as you can see by the accompanying photos. Canadian Jon Consentino won best trick with a nollie heelflip feeble grind down the handrail, but he could have won for any of the multiple tricks he layed down in the best trick comp. In addition to his winning trick he did a tre flip crooks down the hubba and also backside pop shove-it to back smith down the hubba. What a mentalist. But let’s talk about the top placings… In fifth was Fernando Bramsmark. Nando was coming off an ankle injury, but you wouldn’t know it as he was gliding around the park with ease and of course speed. Frontside airs, wall bashes, frontside blunts on the rail and all of course with style. In fourth was 14-year-old Swede ripper Herman Moller. It may be clichéd to say but this kid is one to watch. Speed and precision are two words that best suit Herman. We’ll be seeing more of him in the years to come for sure. Last year Vincent Milou was carted out of the finals in a stretcher with a badly injured ankle. Vincent didn’t skate for four months after that, but that was 2016. In 2017 he’s back and this time with quite a few more tricks and recognisably more board control. Bigspin front blunts on the rail, frontside flip frontside wallrides and hurricanes down the rail are just a few tricks in his arsenal. Second place went to German shredder Hyun Kummer This kid is sick, you may know this 17-year-old by his Instagram handle: @versace_plug. He did this sick ollie where he kicks both feet off: a no-foot ollie? An ollie two-foot? Who knows… Also he did an alley-oop backside flip over the handrail off the slant and kick flip frontside and backside 5-0s down the hubbas. And finally first place honours went to Argentine Matias Dell Olio. He flew a long way from Argentina, but I suppose it was worth if for the €6000 he won. For his finals run basically Matias couldn’t miss: bigspin boards down the rail, 360 flip noseslides, a front feeble across and down the kinked rail and a switch flip switch backside tailslide down the hubba. The level is so high now, makes you wonder how intense it’ll get in the future. Anyways, enough talk. You can see the pics in the gallery below and see for yourself.